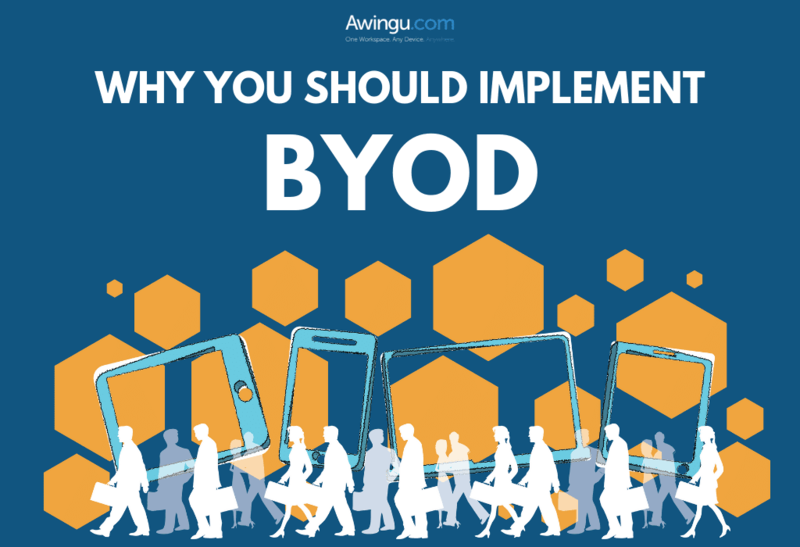 BYOD or ‘bring your own device’ is a trend that has been on the rise for the past decade. Many companies have either fully deployed their BYOD strategy or are investigating how to loosen their policies to enable their workforce to work from anywhere, on any device – even if it’s not one that is managed by the company. Let’s no longer speak of a trend but rather of an evolution in the way we think about work and workplace culture. In fact, the time where BYOD becomes a necessity rather than just an added benefit may come sooner than expected: millennials and ‘gen Z’-ers, the generations of digital natives, will make up roughly 60% of the global workforce by 2020. Research has shown that these groups, in particular, have an increased demand in the ability to use their own device and work remotely: over 74% of them advocate for a flexible work schedule and the option to work from home. It is no surprise that people who grow up with the internet and availability of information at any place and any time have a keen interest in translating that ‘device-agnostic’ philosophy to their way of working. Employee satisfaction: in a study by VMWare, 61% of the respondents admitted to being happier in their jobs if they could use their own devices and tools at work. This, in turn, leads to a higher employee retention and thus more stable workforce. IT dept. priorities: employees, especially the not-so-tech-savvy, who work on company-owned devices with company-owned software will depend on your IT department for any minor problem they’re faced with. Having those people work on the device they’re accustomed to will leave your IT crew with more time to focus on what really matters, rather than fixing the same few errors over and over. Hardware: naturally, letting your workforce use their own device will save you the cost of purchasing company devices in the first place. “IT leaders can spend half a million dollars to buy and support 1,000 enterprise-owned tablets,” Federica Troni (research director, Gartner) says, “while they can support 2,745 user-owned tablets with that same budget. Direct costs of user-owned tablets are 64% lower.” Furthermore, people tend to take more care of their own devices in terms of updates and security. Also, if it happens to break, they will purchase a new device as they consider it primarily to be a personal device that also caters the possibility of working (instead of the other way around). Support costs: a study by Cap Gemini shows that 12% of IT helpdesk ticket requests are for new software installation. By having employees choose the device (and eventually tools) they work with, it is estimated that a corporate store can potentially save over $8.6 million. Customer retention: a workforce that does not ‘leave work at the workplace’ will also be more responsive in terms of emails and customer requests, in its turn leading to a higher customer retention and thus sales. …but why are you still hesitating? Security: according to SecureEdge Networks, BYOD is facilitated in an unmanaged fashion in 80% of the time, which means that hardly any security measures are in place. If a device gets stolen or lost, you’re dealing with a major security breach: anyone can access the working environment of your employee. In the Awingu Unified Workspace, this is tackled the provided built-in multi-factor authentication and SSL offloading. In other words, the data and applications are only available via a highly secure connection, and only to its owner. Data loss: if the ‘stolen device scenario’ happens, there’s not only the issue of having your data breached – if it only exists locally on the device, the hard work you have put into your collection of files will forever be lost. Taking time and data value into the calculation, the average cost of a stolen device is $50.000, so you’ll really want to avoid having any company files stored locally on your ‘BYOD device’. Awingu solves this issue by having a healthy aversion of local data: all your company files are accessible via the browser and remain on your company backend at all times. This is also a lifesaver in the case of ransomware attacks: forget paying fees to retrieve your files, simply throw away the device and continue on any other desktop, laptop or tablet as if nothing has happened. Costs: Awingu is a cost-efficient solution that can be implemented for as low as 20 users for a pricing that is significantly lower than that of other solutions. If you were to make the math of lost hours of IT support and won hours of productivity, providing the Awingu Unified Workspace for your employees pays for itself! Furthermore, Awingu leverages on your current backend so there are no additional investments to be made, which stands in sharp contrast with many other unified workspace providers. Difficulty: we often hear that the typical non-techy employee is afraid of change and difficult environments. This is a concern that we fully understand, and we can empathize with the idea that getting to learn new things will disgruntle your employees and take away precious time. Therefore, we develop Awingu from a user perspective and put the ease-of-use at the top of our priorities. Using Awingu is very simple: take any device, browse to your environment and log in. Nothing needs to be installed on the device, which is quite often the first pain that users face. From there on out, they simply need to open the applications and files they want from our very straightforward user interface – and if that proves challenging, we have enabled guided tours to make your employees feel at ease with the solution and discover how easy it is for them to use. Find out more about how Awingu can enable a simple, secure and cost-efficient BYOD strategy here, and start your free trial account today!